I learned something when I started working at this weird little website. Vans, as it turns out, are good! Especially funky and quirky little vans from Asia. These, as the consensus appears to be, are the best ones. But how much of this is just us reveling (again) in what we couldn’t have? I’ve been lucky to be able to attend a few of the Radwood events now, and every single time I’ve gone I’ve seen some kind of rad Mitsubishi Delica there. Without fail. These vans are pristine, clean and usually sport some kind of custom nostalgic ‘80s decal. So I started paying attention to them. They seem to be good-natured things and they clearly brought a lot of joy to the people who owned and saw them. And then I went to Asia. Taiwan, specifically. There were Delicas and other little vans everywhere, man. On seemingly every corner of every block. I tried keeping track all of the ones I saw and quickly lost count. It was pointless. You see Delicas there like you see F-150s here. Because that’s exactly what they are there: tools. They aren’t collector’s items like they are on this side of the Pacific. The Delicas and CMC Verycas that I came across were filthy, rugged, beat up, covered in stickers advertising businesses and services and, oftentimes, filled with stuff. These were vans that helped people move their things and other people. They lived on the street when they weren’t being used. I saw a dude and his dog living out of one in Taroko National Park. Some had a few artistic touches here and there, but they were largely utilitarian objects. I saw them in all-wheel drive flavors, diesels, you name it. It was refreshing in a way, because these vans offered some perspective. Personally, I’d never even seen a dirty Delica before that. Because we only got a very, very small number of Delicas between 1987 and 1990 (U.S.-adapted ones at that—two-wheel drive and a weak gas engine) the desirable ones remained out of reach until the 25-year import rule was up. As a result of this forbidden nature, obviously the imported Delicas would be in beautiful condition and thoughtfully modified. They’re cherished prizes, not some common transporter. 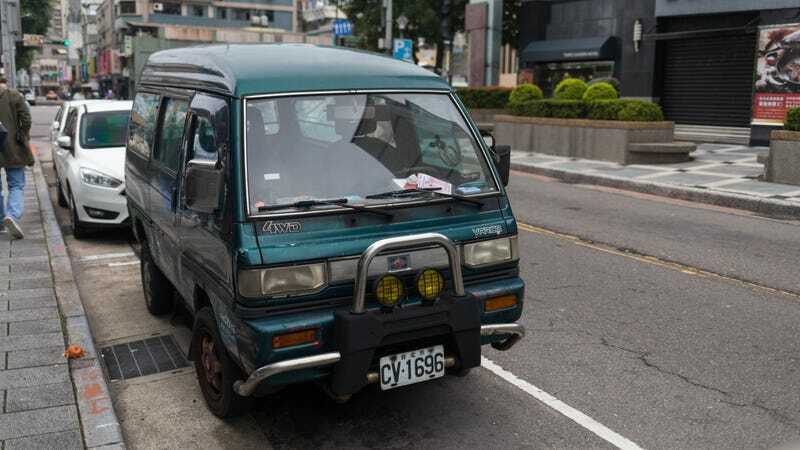 It was easy being an American enthusiast nerding out over coming across these vans, but to the Taiwanese, they were just standard old vans. Probably no one was going to garage theirs forever, clean it up real nice and trot it out at themed car events to the delight of everyone there. Conversely, it’s apparently the same deal with Europeans and big pickup trucks. Recall a particularly lovely moment from one of Raph’s carspotting videos where he runs into a couple visiting New York City from Spain. They are happily checking out a parked Super Duty and explain that in their country, there are no vehicles like it or in that style. Here, big trucks are a dime a dozen and they’re owned by everyone from casuals to the National Park Service. It was nice seeing the vans being used as they were intended. With Taiwan’s relatively mild climate, here’s to hoping that these vans keep puttering across the face of the Earth and helping people move stuff until the end of time.